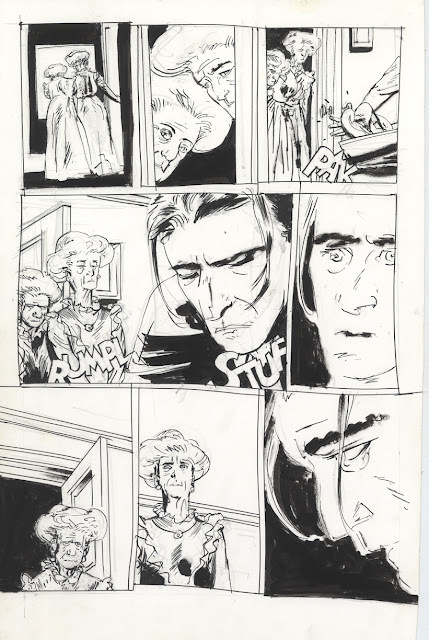 I compare Tony Salmons’ artwork, at his best, favorably to Alex Toth, Jordi Bernet, Joe Kubert, Gene Colan, John Buscema, Jack Kirby, Gerald McCann, Jean Giraud. I’m not just throwing down names of artists I like; I feel Tony Salmons has an affinity with these artists on some level, thought I can’t put my finger on exactly what it is. Perhaps it’s a natural facility , or the ability to crank out work at a high rate of speed (sometimes falling into hacking) combined with imagination and a strong personal style. This is page 9 from issue #3 of "The Strange Adventures of H. P. Lovecraft”, illustrated by Tony Salmons.